This is such a tasty dish. So choose some large Portobello or flat mushrooms – and make a meal of them! Preheat the oven to 190°C, fan oven 170°C, Gas Mark 5. Put the mushrooms, gills facing up, into a roasting tin. Take 8 slices from the aubergine (crossways, not lengthways), then chop any remaining aubergine finely. Heat half the olive oil in a large frying pan and briefly fry the aubergine slices for 1-2 minutes on each side. Remove from the pan. Add the rest of the olive oil to the pan and cook the onion, pepper and chopped aubergine for 5-6 minutes. Add the tomatoes and tomato puree. Cook gently for another 1-2 minutes, then season with salt and pepper. 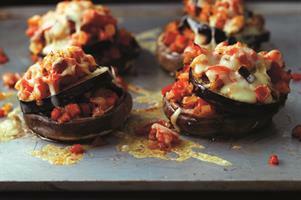 Spoon half the tomato mixture into the mushrooms and top with a slice of aubergine. Spoon the rest of the tomato mixture on top, then sprinkle with the cheese. Transfer to the oven and bake for 20-25 minutes. Serve 2 mushrooms per person. Cook’s tip: It helps if you can select mushrooms that are about the same size.